Open Streets events temporarily close streets to automobile traffic and open them to people on bikes, pedestrians and other modes of non-motorized transportation. The events are a great opportunity for local residents to have a car-free day and potentially try transit for the first time to get to an event. On past days of Open Street events in Los Angeles Country, Metro ridership has increased up to 10 percent system-wide and TAP card sales increased 17 percent. This month the Metro Board will consider funding another round of the Open Streets Grant Program, potentially providing funding to cities to implement 17 Open Street events throughout Los Angeles County through December 2018. At the request of the Board, Metro staff awarded additional points to first-time events, events that include disadvantaged communities and events that are held in multiple cities/communities. 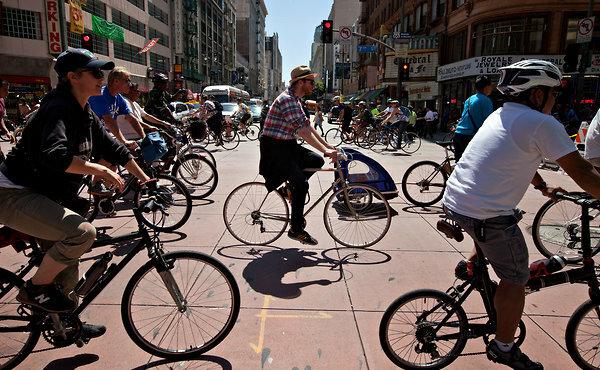 As many local residents know, since the first CicLAvia event in 2010 was held, Open Streets have quickly become very popular and a big part of the livable cities movement in Los Angeles County. The events have become a fun — and increasingly — common way for cities to remind everyone there are alternatives to driving that are both good for public health and economic equity. This reality is not missed by Metro, which funded 10 such events over the last two years. In 2016 Metro had the largest Open Street program in North America including nearly 70 miles of events. Now Metro is ready to move forward with more Open Streets funding to help the region move toward its long-term goal of more sustainable transportation options. 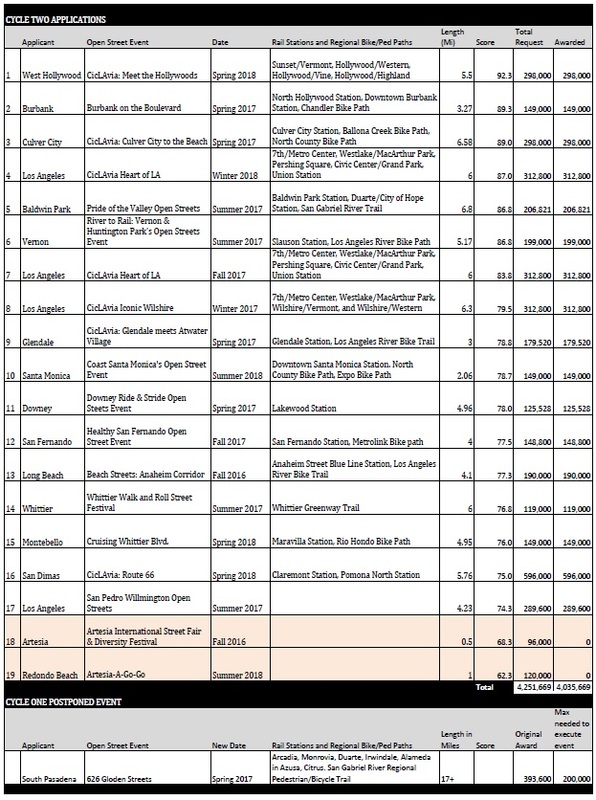 The staff report below shows the 17 events recommended for funding plus additional funds to ensure that the 626 Golden Streets event (postponed due to wildfires) will be rescheduled in early 2017. The final decision will be made on September 22nd at the Monthly Metro Board Meeting. Check out the interactive google map to see the events that are proposed for funding. How We Roll, Sept. 9: does anyone have the faintest idea what the future will be like? A perfect example of the MTA’s quest to spend money on anything other than excellent bus service. As I noted before, Metro needs to work more proactively with the event organizers to prevent disruption of their services. The recent DTLA CicLAvia really screwed up bus services on the weekend since this is where numerous routes converge. Just like the Metro tax initiative, the majority of events and funding are in the little circle of the City of Los Angeles, while the taxes funding all of this come from a disproportionate majority well outside of the City, Riverside, San Bernadino, South Bay, Orange County. No wonder all the Metro buses and trains in these communities are empty except for criminals. Sharla, thank you for your comment. Applicants must be a city within Los Angeles County; Riverside, San Bernardino and Orange County are not in Los Angeles County and are therefore ineligible for funding. In an effort to ensure a regional distribution of events throughout Los Angeles County, funding was awarded based on the jurisdiction’s population share of the County.